Week six didn't look like a huge obstacle for the top-ranked sides, but it proved to be another fascinating Saturday. Oklahoma's stunning home loss to Iowa State will rightly steal all of the headlines, and it just shows how important every game is in the race for the end of season playoff. Outside of all of the storylines regarding ranked times and rivalries, Western Michigan and Buffalo played out the highest-scoring game in FBS history. The game went to seven overtimes, before the Western Michigan Broncos finally prevailed 71-68 over the Bulls to set a new mark of 139 combined points. In the biggest upset of the season to date, the third ranked Oklahoma Sooners suffered a stunning 38-31 loss at home to the Iowa State Cyclones. Leading by two touchdowns during the second quarter, Oklahoma somehow managed to lose a contest which saw the visiting side score on all of their final five drives. Playing with a back-up quarterback, Iowa State took their first lead with 12.46 left on the clock, before Baker Mayfield marched his side back down the field to tie it up with Dimitri Flowers running it into the end zone from a yard out. 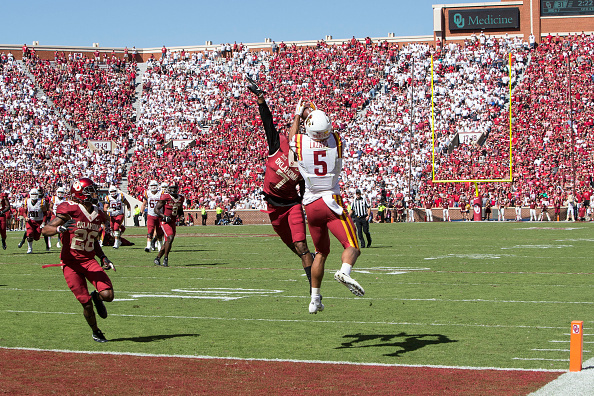 The Sooner defence just couldn’t force a stop however, and with just over two minutes left on the clock Kyle Kempt threw the ball up for Allen Lazard who made a stunning grab in the endzone to restore the seven-point lead. Needing to respond, the Sooners offence couldn’t hold up their end of the bargain and Iowa State snapped an 18-game losing streak against Oklahoma in the biggest story of the week six slate. 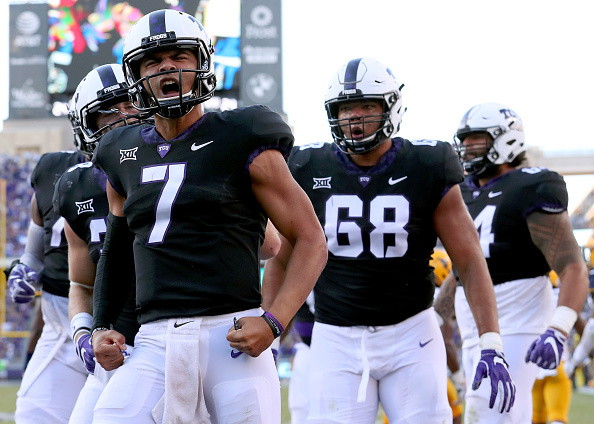 That result in Norman opened up the door for other Big 12 teams, and TCU waltzed right through after beating West Virginia 31-24 in the only matchup between two ranked sides on Saturday. With College Gameday in attendance, Fort Worth was bouncing, and the eighth-ranked Horned Frogs left it late before confirming the win to remain as the only undefeated side in the conference. Quarterback Kenny Hill scored three touchdowns for Gary Patterson’s side, the last of which was the go-ahead score with three minutes left on the clock. After throwing a six-pointer to Jalen Reagor, Hill then caught a pass from KaVontae Turpin on a trick-play before taking the ball 48 yards to the house. Then, after Mountaineers QB Will Grier had responded, TCU drove into West Virginia territory and from three yards out Hill managed to force his way into the endzone to cap a game-winning 13-play drive. Michigan State have done it again. Mike Dantonio’s charges have now won eight of their last ten games over Michigan, this time a 14-10 triumph at the Big House. Young signal caller Brian Lewerke outplayed compatriot John O’Korn for much of the contest, which suffered a deluge of rain during the second stanza. 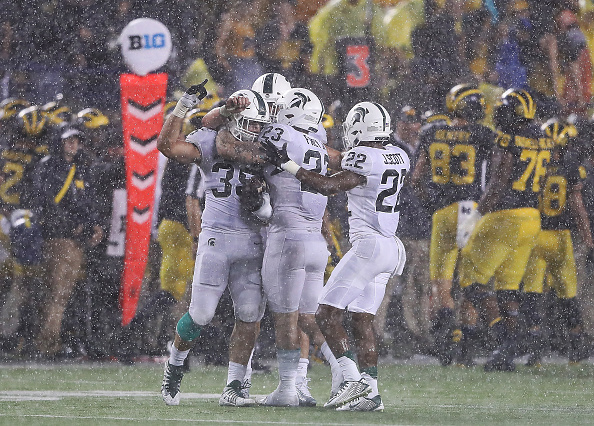 Lewerke ran for, and threw for a first-half touchdown, while O’Korn led a Wolverines offence which suffered five turnovers with Ty Isaac and Sean McKeon fumbling away possession on a wet night. Jim Harbaugh’s record against rivals is now not looking too smart, with this defeat now seeing him fall to 1-4 combined against Michigan State and Ohio State as Sparty departed with the Paul Bunyan trophy once again. In Tallahassee, Miami snapped a seven-game losing streak against Florida State in the most dramatic of circumstances. With just three points in the first-half, the game came to life in the fourth-quarter, and despite James Blackman hitting Ryan Izzo and Auden Tate for scores, the Seminoles went down to their third loss of the season. Braxton Berrios was the standout player, hauling in two scores for the ‘Canes, before Darrell Langham stretched into the endzone with six seconds left on the clock after being hit perfectly by a pass from QB Malik Rosier to complete the win. After handing out two humiliating beatdowns over the past fortnight in SEC play, Alabama finally had to play into the final quarter during a conference game in 2017. 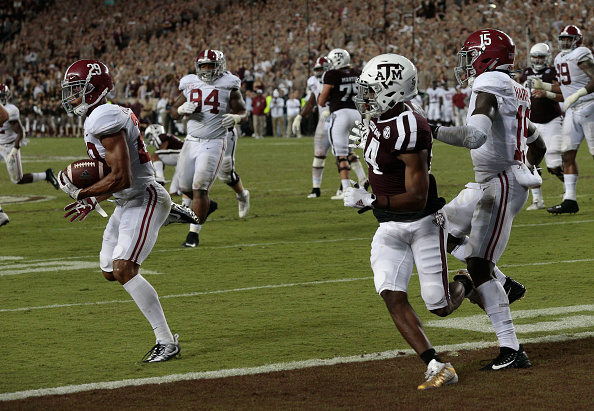 That came at College Station against a fiery Texas A&M side led by young quarterback Kellen Mond and the Crimson Tide eventually moved to 6-0 following the 27-19 win. Mond completed 19 of his 29 passes but had no help for the running game, with the Aggies only able to put up 71 yards from their 40 attempts on the ground. In comparison, Bama averaged over five yards per carry with Damien Harris rushing for 124 yards which included a 75-yard touchdown scamper in the first quarter. Clemson will be sweating over the injury updates on starting quarterback Kelly Bryant after he limped out of their 28-14 win at home to Wake Forest. Behind Alabama, there are a pair of mightily strong contenders in the SEC. Georgia will likely take Oklahoma’s spot in the top four after they stomped all over Vanderbilt in a 45-14 road win, while Auburn running back Kerryon Johnson ran for 204 yards and three touchdowns in the Tigers 44-23 victory over Ole Miss at Jordan-Hare Stadium. Also in the South-Eastern Conference, LSU took advantage of a botched PAT as they claimed a 17-16 win over the 21st ranked Florida Gators at the Swamp. Saquon Barkley finally found his groove in the second-half, hitting a 53-yard home-run touchdown in Penn State’s 31-7 win on the road against Northwestern. Aside from that, the Heisman frontrunner was bottled up by the Wildcat defence, and the Nittany Lions will need to work on opening more holes for him in the running game on the other side of their upcoming bye week when they face Michigan and Ohio State in consecutive weeks. 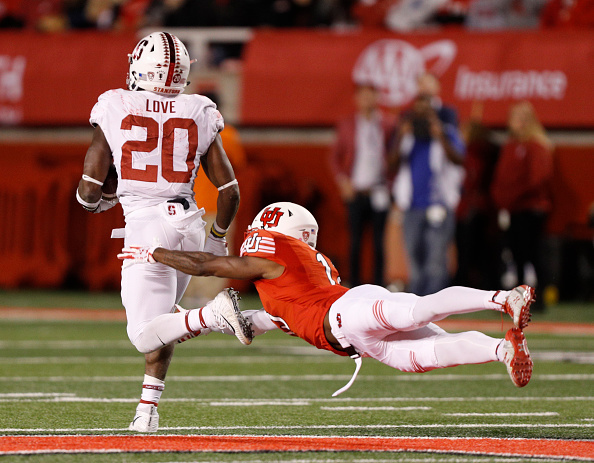 If it wasn’t for Barkley’s long scoring run during the third-quarter, Bryce Love would probably have moved ahead of him in the Heisman race. The Stanford back went up against a vaunted Utah run defence on the road, but still managed to rush for 152 yards and a score in the Cardinal’s 23-20 win. Another young back who continues to put up big numbers is Wisconsin’s Jonathan Taylor, and his big game on the ground fuelled the Badgers 38-17 win over Nebraska. Taylor rushed for two touchdowns and 249 yards from his 25 carries for a 5-0 Wisconsin side who could remain a big player in deciding the College Playoff spots come season’s end. Ohio State continue to win big under the radar, putting up 62 points in their rout of Maryland, and over on the West coast, Sam Darnold threw three touchdowns and one interception in USC’s 38-10 victory at home to the Oregon State Beavers. The state of Washington should have two top ten ranked sides come the latest AP poll after both of their sides romped to big wins in the Pac-12 to each remain undefeated this season. At Husky Stadium, Washington dominated in all facets of the game during their 38-7 triumph over the California Golden Bears. Myles Gaskin rushed for 91 yards and two touchdowns, while tight-end Hunter Bryant hauled in nine of Jake Browning’s passes to the tune of 121 yards and a score. The most remarkable statistic from the game however, reveals that Cal registered -41 yards of rushing from their 26 carries with their longest run going just nine yards. 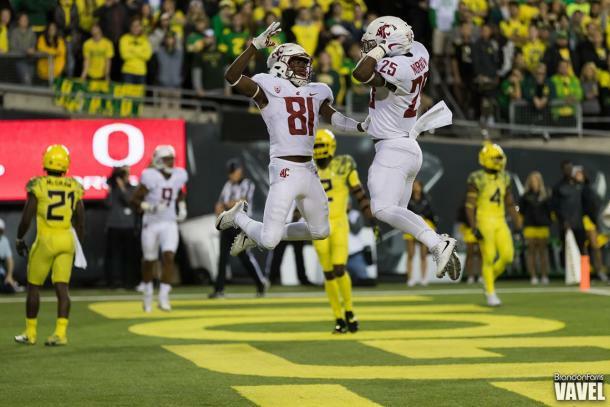 The Washington State Cougars might share an equally mean defence, and despite going up against a back-up QB, they claimed a 33-10 win over the Oregon Ducks in Eugene. 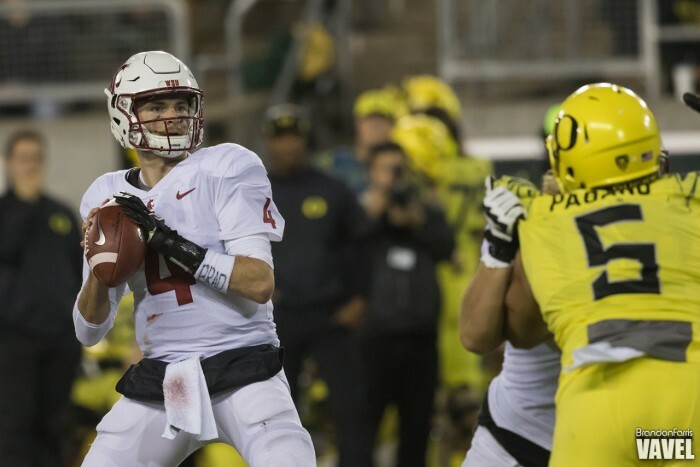 Luke Falk registered three touchdowns and 282 yards in the win, with Isaiah Johnson-Mack, Jamal Morrow and Renard Bell all claiming receiving scores on a night where Wazzu kicker Erik Powell was successful on all seven of his attempts (3 PAT’s, 4 FG’s). 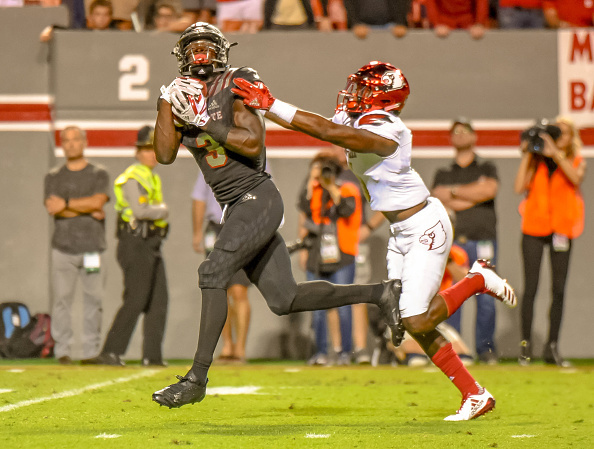 On Thursday evening, the 24th ranked NC State maintained their perfect start to conference play with a 39-25 victory at home to #17 Louisville in Raleigh. The Wolfpack defence kept Lamar Jackson in check for the most part, allowing him to complete less than 60% of his passes, while holding him to only 3.8ypc on the ground. The reigning Heisman Trophy winner still managed to put up three touchdowns and over 400 yards of offence in defeat, but it wasn’t enough against their now 5-1 opponents. Ryan Finley had a strong night at quarterback, throwing for 367 yards and a score to Kevin Harmon (133 yards from six receptions), but the offensive star for the home team was Nyheim Hynes who ran for 102 yards and two touchdowns. It was a one-score game going into the final minutes, before a pick-six from Germaine Pratt of Jackson iced the contest as NC State prevailed. The following evening, Riley Ferguson threw seven touchdowns, four of which were hauled in by Anthony Miller (224 yards) during Memphis’ 70-31 humiliation of Connecticut.